Bad Ischl was chosen from the Habsburgs as a summer resort and til today it has an incomparable charm. You can also make a trip to the top of the Katrinalm. 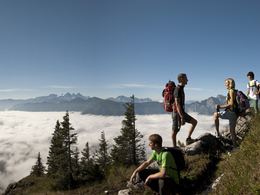 The mountain "Katrin" is very close to Bad Ischl and the most panoramic mountain in the region Salzkammergut. From the top you can see seven lakes and the mountains in the surroundings. For those who prefer a cozy afternoon, Bad Ischl has a very traditional cafe, the Café Konditorei Zauner. You have to taste a very good regional product, the Zaunerstollen.